Economical Protection: Hayward® Y-Strainers protect piping system components from damage caused by dirt or debris in the process media. They cost less than other types of strainers and are light weight and very compact. Because they can often be supported by the pipeline alone, they work in applications where other types of strainers cannot. Rugged Plastic Screens: Hayward® Y-Strainers are supplied with a 1/32" perforated plastic screen. This screen is ultrasonically welded, not glued, for superior strength. Screens fabricated from Type 316 stainless steel are also available in openings from 1/2" down to a super fine 325 mesh. All screens have an open area at least twice that of the equivalent pipe size cross-sectional area to minimize pressure drop. Easy Clean Out: All sizes of Hayward® Y-Strainers feature a heavy-duty hex cap that permits quick and easy removal of the strainer screen when cleanout becomes necessary. Adaptable Design: Hayward® Y-Strainers work equally well in the horizontal or vertical position, simplifying piping system layout. Clear PVC Construction Available: See how much dirt and debris have been trapped by the strainer screen in the Hayward® Clear PVC Y-Strainer. The translucent PVC body permits viewing of the strainer screen in operation. This helps determine when it needs cleaning based on a visual check of the amount of debris retained by the screen. 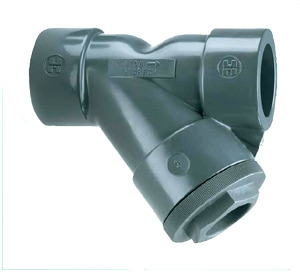 These Y- Strainers are available in sizes from 1/2" to 2" with socket or threaded pipe connections. All Plastic Construction: Hayward® Plastic Y-Strainers will never rust or corrode, and they don't require painting or an epoxy coating to survive corrosive environmental conditions. All Y-Strainers have an FPM o-ring seal and are assembled with silicone free lubricant. Each Y-Strainer includes one 1/32" perforated plastic screen. All Y-Strainers have an FPM* o-ring seal and are assembled with silicone free lubricant. Each Y-Strainer includes one 1/32½ perforated plastic screen. *EPDM available, consult factory.